Unlike other underwear, Dignity’s Free & Active Incontinence Briefs feature a built-in pad designed to guard against light to moderate Incontinence. The briefs are made from a 50/50 cotton/polyester blend with a fly-front and are machine washable. 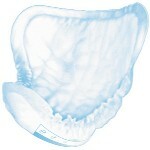 The center of the garment has multi-layered, extra absorbent padding, covered by a stay-dry lining. Use either disposable or reusable pads in conjunction with the built-in pad for moderate to heavy Incontinence. We recommend our Dignity’s ThinSerts, our Dignity’s Free & Active Super Absorbent Disposable Pads, or our Manhood Disposable Pouch. Available sizes range from Small to 2X Large. Worry-Free bladder control protection for Moderate Incontinence. Built-in Absorb 2000 Pad with Fosshield Anti Microbial Fibers to control order. Functional fly. Reusable for at least 200 washings.